What Is Yoga Nidra? Yoga Nidra is a powerful technique that yoga sages have been using for thousands of years. Yoga Nidra means “yogic sleep.” Yoga Nidra refers to a state of consciousness and not to a particular technique. It’s a state of conscious deep sleep that goes far beyond deep relaxation to an inborn place of intrinsic peace and quiet. It’s a glorious place where awareness remains yet the thinking mind withdraws. What’s experienced is awareness without words, thoughts, images, feelings and other sensations. It’s where our innate wisdom, intelligence and intuition naturally reside. It feels fantastic! What are the benefits of Yoga Nidra? With regular practice, your health will improve. Scientific studies have shown that real relaxation and yoga nidra helps with a variety of physical and mental problems. It can boost your immune system, lower blood pressure, and decrease pain. Though it’s not a substitute for sleeping, one hour of yoga nidra equals about 4 hours of typical sleep because the brain wave state we’re in is extremely restful and relaxing. You’ll enjoy living with a clear head. Eventually, mood swings and emotional upsets won’t bother you. Your creativity and intuition will flourish in a positive and productive way. Plus, your energy increases. See more documented benefits of yoga nidra here. Is Yoga Nidra different from hypnosis? Yes. In hypnosis, we’re in a brain wave state that is not as deep as in yoga nidra. With hypnosis, someone else makes suggestions to us in this altered state. In Yoga Nidra, positive suggestions originate and come from within ourselves for lasting and constructive change. This is called setting a resolve, or sankalpa. energetically, mentally, and emotionally. Doing so is deeply soothing and it naturally awakens innate wisdom and intuition. During the yoga nidra process, you’ll be invited to get comfortable lying down on a yoga mat or something similar. Specialized relaxation exercises, breathing techniques, meditation, and guided imagery are utilized for becoming extremely relaxed and to replenish energy. Yoga nidra effectively handles everyday tension and is capable of healing deep-seated stress. It is much more than a quick fix. How does Yoga Nidra help me make positive changes? What is a resolve, also called a sankalpa? The brain wave state we’re in during Yoga Nidra is fertile ground. We’re both very relaxed and very receptive. Setting a resolve during this time makes it completely possible to clear out useless habits and bring about positive and permanent changes in your personality and life. So, choose something worthwhile that has meaning and significance for you as your resolve. Some examples are kindness, courage, and love or something to give meaning to your life purpose. The sankalpa (resolve) is stated briefly, sincerely, and in the present tense at the beginning and end of yoga nidra. Use the same one until it becomes a living reality. 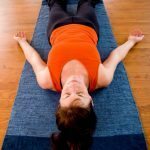 How often should I do Yoga Nidra? Regular practice (daily to several times a week) is strongly recommended, especially if you want to reap the benefits. 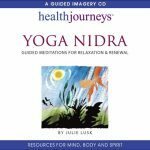 Note: Refer to Yoga Nidra for Complete Relaxation and Stress Relief by Julie Lusk (NHP 2015) for a clear and complete information on yoga nidra. It’s available at the WholesomeResources.com store. One technique that is used to achieve the state of conscious awareness known as yoga nidra, is to mentally scan the body using a specific order and duration based on the sensory-motor cortex, also called the homunculus. It is recommended to follow the same sequence to help bring about the movement of prana (life force) and create a healthy flow of energy. If you look closely at the diagram of the brain’s sensory-motor cortex below, you will notice that more area is devoted to certain places than to others. For instance, compare the relatively large amount of area dedicated to the hands and fingers with the small amount dedicated to the hips. 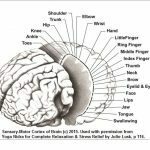 This is why more time is intentionally spent scanning the areas of the body with more of the brain dedicated to it during the practice. 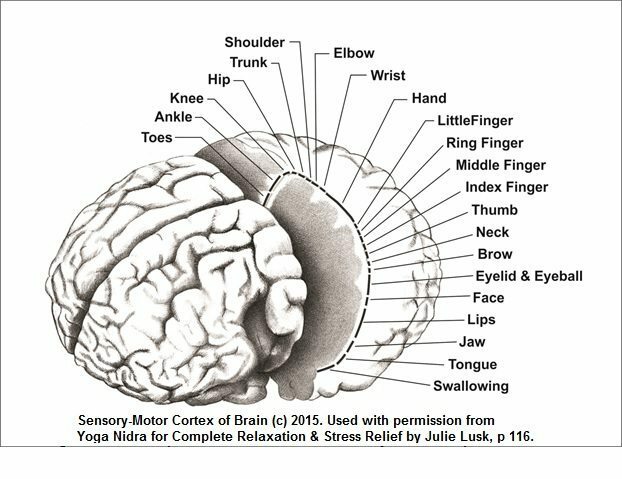 Sensory-motor cortex © as shown in Yoga Nidra for Complete Relaxation and Stress Relief by Julie Lusk. Click image to enlarge. The diagram below shows the subtle energy centers, called chakras, that are also mentally scanned. Chakras are associated with physical, psychological, emotional and spiritual health, and more. How to Experience Yoga Nidra: Like all worthwhile things, regular practice yields the best results. 1) To experience yoga nidra for yourself, use the recordings listed below. 2) Look for yoga nidra workshops and retreats here. 3) Take a yoga nidra teacher training course and earn a certificate here. The map of consciousness technique is used on the Yoga Nidra for Sensing Inner Strength & Balance CD and the Real Relaxation: Yoga Nidra CDs listed below. Chakra awareness and balancing is featured on both of these recordings. A progressive muscle relaxation (PMR) technique is used on Yoga Nidra for Unshakable Peace & Joy. Every muscle group is consciously tensed and released during progressive muscle relaxation. Specialized breathing techniques follow along with ways to calm restless thoughts and feelings are done. The autogenic training technique is the focus on Yoga Nidra for High-Level Living. Statements are silently repeated to produce sensations of heaviness and warmth throughout the body are used. The paradox of opposites is featured as well as mindfulness, the awareness of witnessing one’s experience, are also used. Yoga nidra’s benefits are remarkable. Yoga nidra means “yogic sleep.” It’s a comprehensive meditative practice for going far beyond deep relaxation to a place of natural peace and quiet that is tremendously healing for the body, mind, and spirit. Unique skills are developed for handling stress and tension in the short term and for the long run. Yoga nidra feels extremely peaceful and is very refreshing. It’s based on classical yoga and backed by contemporary science. Activates the relaxation response and deactivates the stress response. This improves functioning of the sympathetic and parasympathetic nervous systems (ANS) and the endocrine system (glands and hormones). Transforms thoughts and feelings of separation into a direct experience of wholeness. Experience yoga nidra’s benefits for yourself. Like most worthwhile things, regular practice yields the best results. This book and audio set is everything you need to get started and will support your practice for years to come. Amita, S. et al. 2009. Effect of Yoga Nidra on Blood glucose Level in Diabetic Patients. Indian Journal of Physiological and Pharmacol, Vol. 53 (1): 97-101. Panda, Nursingh Charan. 2003. Yoga-Nidra: Yogic Trance Theory, Practice and Applications. New Delhi, India: D.K. Printworld (P) Ltd.